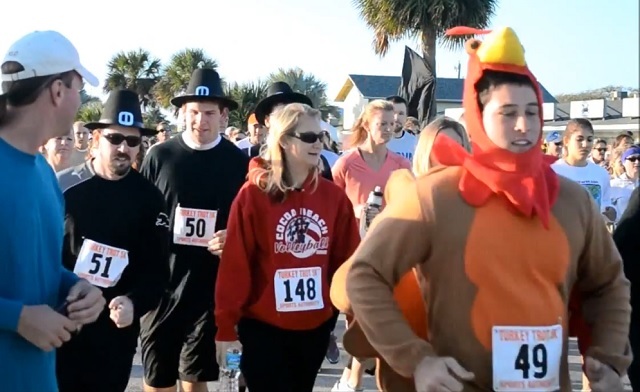 COCOA BEACH, Florida -- The 2016 Cocoa Beach 5k Turkey Trot will place Thanksgiving morning at 8 a.m. The event consists of a Cocoa Beach road race for runners and walkers through the residential Cocoa Isles neighborhoods. The race starts and ends at the Baliwick Mall, located just north of Minuteman Causeway on Brevard Avenue. The 5k Turkey Trot kicks off the 2016 Cocoa Beach Art Show and Music Festival which also takes place Thanksgiving weekend.